Laura Smith’s popular class is back! 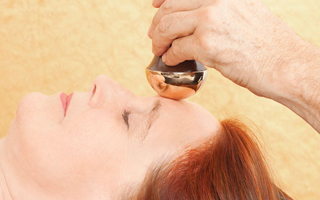 Join us in learning how to soothe and energize the face and head the Ayurvedic way. We will discuss: marma points, how to read the map of the face, and the use of essential oils and kansa wands. We will pair up to learn the traditional massage sequence that opens the channels and eases the subtle stress we often hold in the facial muscles. Upon registration you will receive an email with a link to purchase a kansa wand. This is an optional purchase.